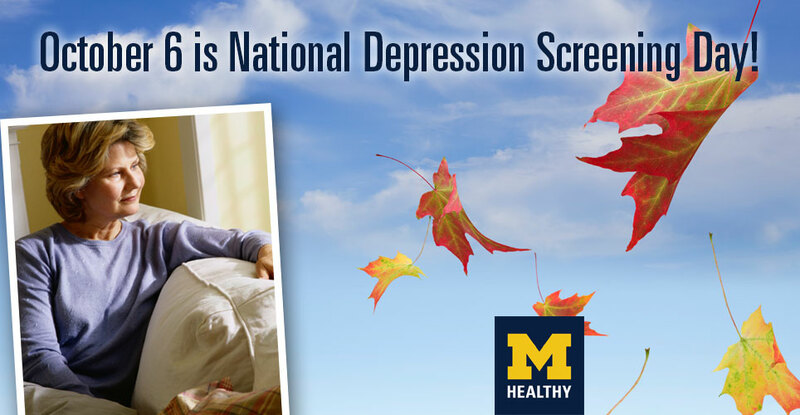 In support of National Depression Screening Day, this Thursday, October 6, several U-M programs are offering faculty, staff, students and the community free in-person and online mental health screenings for depression. Screenings are a good way to find out if depression might be the cause of feelings like prolonged sadness, anxiety, irritability, loss of pleasure, hopelessness and worthlessness, and even physical pain. Free one-on-one confidential screenings with a trained mental health professional will be available on Oct. 6 for depression and other conditions at the following locations. Feedback provided after a screening is informational, not diagnostic. Based on screening results, the mental health professional may recommend a more comprehensive evaluation. Free online mental health screenings are available at any time for depression and other conditions, including bipolar disorder, generalized anxiety disorder, alcohol misuse, eating disorders and post-traumatic stress disorder. Participants will receive an immediate result at the end of each screening to print and take to a counselor for further evaluation if necessary. For faculty and staff, MHealthy offers confidential, anonymous online mental health screeings. For students, Counseling and Psychological Services (CAPS) offers confidential, anonymous online mental health screenings on the CAPS website. For the general public, the U-M Psychological Clinic offers confidential, anonymous online mental health screenings on their website. Just scroll down to the yellow screening button. For the general public, the U-M Psychological Clinic offers outpatient mental health services for adults and couples 18 and over. It is a fee-for-service clinic that accepts some insurance plans. University affiliation is not required. Call (734) 764-3471 or visit their website for more information. More information is available on the MHealthy website.